Super Eagles striker Tunde Adeniji has expressed his delight at scoring on his competitive debut for Al Nasr as they shared the spoils with a 1-1 draw against Al Salmiyah on Saturday afternoon. 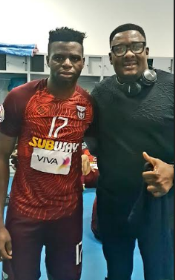 ''I feel very happy scoring because this is my first game for the club and with the support from my teammates, they made it easy for me,'' Adeniji told allnigeriasoccer.com immediately after the game. When asked about his target for the remainder of the season, Adeniji said : ''My target is to score more goals which I don't know the number of goals I will score. The Sunshine stars product concluded by saying that the Super Eagles are one of the teams to watch out for at this summer's Africa Cup of Nations : ''I believe we have good players and good coaches and we will do well in the AFCON. I have belief in the Super Eagles players''. Adeniji's Italian-based agent, Ben Itorho watched his client score on his debut against Al Salmiyah.